1) Spoilage refers to ________. 2) Rework refers to ________. 3) Which of the following is an example of spoilage? 5) A production process which involves spoilage and rework occurs in ________. 6) Which of the following is an example of scrap? 7) Some amounts of spoilage, rework, or scrap are inherent in many production processes. 8) An item classified as spoilage has no value. scrap value. It is not necessarily thrown out. converted into a salable product. that are subsequently repaired and sold as good finished units. redone and sold as finished goods. low sales value relative to the product with which it is associated. cuts from suit-making operations. Scrap can sometimes be sold for relatively small amounts. 12) Scrap and rework are considered to be the same thing by managerial accountants. 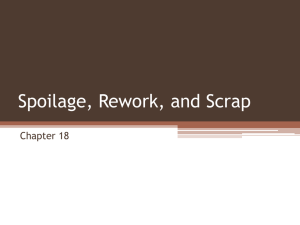 Explanation: Scrap and rework are not considered to be the same thing by managerial accountants. 13) There is no difference between scrap which can be sold for relatively small amount and a byproduct. product targeted for manufacture or sale by the firm. 14) Distinguish among spoilage, reworked units, and scrap. Give an example of each. customers, can sometimes be reworked and sold as good products. 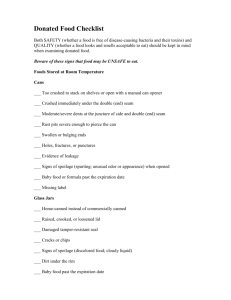 15) For each of the following items identify whether it is spoilage, reworked units, or scrap. operating conditions is referred to as ________. 3) Costs of normal spoilage are usually accounted for as ________. 4) Costs of abnormal spoilage are usually accounted for as ________. 5) The loss from abnormal spoilage account would appear ________. 6) Normal spoilage rates are computed by ________. 9) Which of the following statements is true of normal spoilage? A) It is a spoilage which is not inherent in a particular production process. B) It occurs due to machine breakdowns and operator errors. C) It is usually regarded as avoidable and controllable. D) It arises even when the process is carried out in an efficient manner. 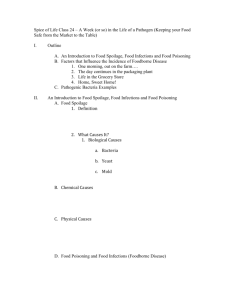 10) Which of the following statements is true of an abnormal spoilage? 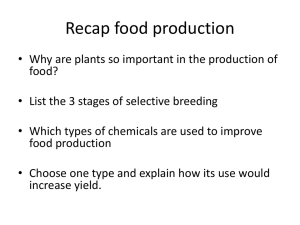 A) It is a spoilage which is inherent in a particular production process. B) It arises even when the process is carried out in an efficient manner. 11) Which of the following statements is true of normal spoilage and abnormal spoilage? inherent in a particular production process. spoilage does not arise when the process is carried out in an efficient manner. whereas costs of abnormal spoilage are included as a component of the costs of good units manufactured. 13) Abnormal spoilage is spoilage inherent in a particular production process. Explanation: Normal spoilage is spoilage inherent in a particular production process. 14) Abnormal spoilage is spoilage that should arise under efficient operating conditions. Explanation: Abnormal spoilage should not arise under efficient operating conditions. Spoilage account, which appears as a separate line item in an income statement. 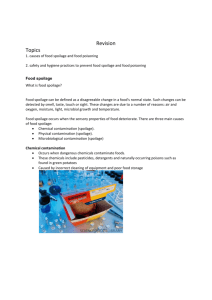 16) Spoilage can be considered either normal or abnormal. 17) Normal spoilage is spoilage that is NOT considered to be inherent in a production process. Explanation: Normal spoilage is spoilage that is considered to be inherent in a production process. 18) Under efficient operating conditions, all spoilage is considered to be abnormal spoilage. arises even when the process is operated in an efficient manner. completed, NOT total actual units started in production. 20) Costs of abnormal spoilage are separately accounted for as losses of the period. 21) There is a tradeoff between the speed of production and the normal spoilage rate. 22) Normal spoilage is usually regarded as avoidable and controllable. 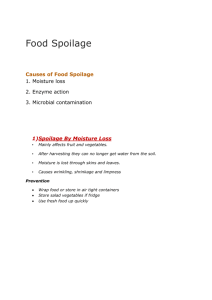 Explanation: Abnormal spoilage is usually regarded as avoidable and controllable. 23) Units spoiled due to machine breakdowns and operator errors are normal spoilage. Explanation: Units spoiled due to machine breakdowns and operator errors are abnormal spoilage. identifying the reasons for machine breakdowns, operator errors. spoilage by identifying the reasons for machine breakdowns, operator errors. 25) Costs of abnormal spoilage are considered inventoriable and are written off as a period expense. period expense. But it is true for normal spoilage. 26) What are the objectives in accounting for spoilage? spoilage. This information must be reported and available to management on a timely basis. 27) What is the distinction between normal and abnormal spoilage? usually regarded as avoidable and controllable. materials costs. Spoilage is not detected until the process is complete. 1) What is the direct material cost per equivalent unit? 2) What is the direct material cost assigned to good units completed? 3) What is the amount allocated to the work-in-process ending inventory? 4) What is the number of total spoiled units? 5) Normal spoilage totals ________. 6) Abnormal spoilage totals ________. 7) What is the total cost per equivalent unit using the weighted-average method of process costing? 8) What cost is allocated to abnormal spoilage using the weighted-average process-costing method? some fillets are spoiled due to nondetectible defects. Inspection occurs when units are 50% converted. 10) What is the number of total spoiled units? 11) Normal spoilage totals ________. 12) Abnormal spoilage totals ________. 13) What is the total cost per equivalent unit using the weighted-average method of process costing? 14) What cost is allocated to abnormal spoilage using the weighted-average process-costing method? 16) The cost per good unit in the weighted-average method is equal to the ________. 17) Excluding spoiled units in the equivalent-unit calculation results in ________. A) lower cost per good unit. 18) The inspection point is the ________. 19) Under the FIFO method, all spoilage costs are assumed to be related to the units ________. 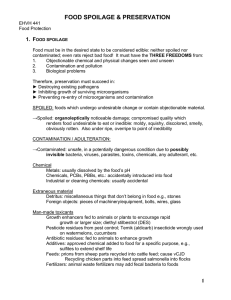 20) What are the normal and abnormal spoilage units, respectively, for March when using FIFO? costs, respectively, using the FIFO method of process costing? current period using the FIFO method of process costing? are included at the inception of the production cycle and must be bundled in single kits for each unit. placed into production. After inspection, some units are spoiled due to nondetectible material defects. 24) What are the normal and abnormal spoilage units, respectively, for February when using FIFO? completion of the conversion of the units during the month. Use the FIFO method of process costing. of the units during the month. Use the FIFO method of process costing. before the end of the period? 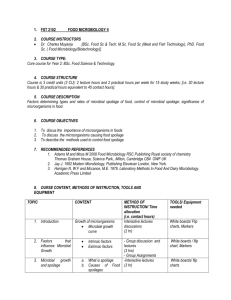 during February using the FIFO method of process costing? the flow of physical units. costs to units completed, to spoiled units, and to units in ending work in process. Explanation: Counting spoiled units usually results in a lower cost per unit. of good units under the weighted-average method of process costing. transferred out divided by the number of good units produced. 36) Spoilage is typically assumed to occur at the stage of completion where inspection takes place. 37) Spoilage and rework costs are thoroughly captured in the accounting system. contribution margin are not recorded in accounting systems. this period using the unit costs of the current period. 40) Normal spoilage costs are usually deducted from the costs of good units. Explanation: Normal spoilage is usually added to the cost of the good units. process. For March, there were 2,800 units in beginning inventory with a direct material cost of $1,400. started in March and that 60,000 were finished. Normal spoilage of 2% of units finished was incurred. until the process is complete. Endicott uses the weighted-average method. a. What are the direct materials costs assigned to completed good units? b. What are the direct material amounts allocated to the work-in-process ending inventory? Prepare a production cost worksheet if spoilage is recognized and the weighted-average method is used. detected at the end of the process. Ending WIP is 60% completed as to conversion. complete. All spoilage is considered normal and is detected at the end of the process. inventories included $16,000 for transferred-in costs and $10,000 for direct manufacturing labor costs. are complete in respect to direct materials costs. Spoilage is not detected until the process is complete. a. What is the cost per equivalent unit? b. What are the costs assigned to completed units? c. What are the costs transferred out? d. What are the amounts allocated to the work-in-process ending inventory? that provides closer tracking of the spoilage with the accounting for the spoilage. Discuss the problems Harriet is having with the accounting system. the spoilage can be accounted for as the process completes each stage. 1) When spoiled goods have a disposal value, the net cost of the spoilage is computed by ________. to completed units if the units ________. 3) Normal spoilage is computed on the basis of the number of ________. work in process was completed and ending work in process was started during the period. 5) Early inspections can ________. 6) Cost of spoiled units equals ________. A) Unit cost of normal spoilage is more than unit cost of abnormal spoilage. B) Unit cost of normal spoilage is equal to unit cost of abnormal spoilage. C) Unit cost of abnormal spoilage is more than unit cost of normal spoilage. good units produced and transferred. 8) Which of the following statement is true of costs of normal and abnormal spoilage? are shown as liabilities in a balance sheet. inspection point equals $9,500,000. Calculate the net cost of the spoilage. to determine where the spoilage has happened until the inspection has occurred. disposal value to the costs of the spoiled goods accumulated to the inspection point. spoiled goods accumulated to the inspection point. only at one or more inspection points. 16) If a company inspects units only at the end of the production process, the units in ending work-inprocess inventory are not assigned any costs of normal spoilage. the point of inspection. Spoilage costs, therefore, vary based on different inspection points. 19) Why do firms often conduct multiple inspections? undetected at later stages of the process. 20) What is the advantage and disadvantage of early inspections? how the costs of normal spoilage get allocated. units is equal to the all costs incurred in producing the spoiled units up to the point of inspection. of the determination of when in the process the inspections should happen. spoilage is detected. The current job requires the production of 3,000 good parts. Which of the following journal entries properly reflects the recording of spoiled goods? 3) Which of the following is a journal entry to recognize the disposal value? 4) To recognize the disposal value of normal spoilage, ________. A) Manufacturing Overhead Control account is debited with spoiled goods at current net disposal value. B) Materials Control account is debited with spoiled goods at current net disposal value. C) Work-in-Process Control account is debited with spoiled goods at current net disposal value. D) Manufacturing Overhead Control account is credited with spoiled goods at current net disposal value. A) Classifying spoilage as normal rather than abnormal results in same current operating income. 6) Which of the following sentences is true of normal spoilage and abnormal spoilage? abnormal spoilage costs are deducted from the cost of good units produced. while normal spoilage costs are expensed in the accounting period in which they occur. normal spoilage costs are expensed in the accounting period in which they occur. abnormal spoilage costs are expensed in the accounting period in which they occur. the accounting period in which the abnormal spoilage is detected. specific job from normal spoilage common to all jobs. period in which the abnormal spoilage is detected. accounting period in which the abnormal spoilage is detected. provision for the normal spoilage cost. decrease in current operating income. in an increase in current operating income. best managers have even threatened to quit unless the accounting system is changed. What recommendations can you suggest to improve the accounting for spoilage? were being worked on when the machines or process malfunctioned. 13) How do job-costing systems account for spoilage? 3) If the rework is abnormal ________. 4) If a company set a standard of zero rework ________. manufacturing overhead and are spread, through overhead allocation, over all jobs. cost of all orders is $18.34, including rework, with an average selling price of $25. as to transfer the reworked items finished goods to Finished Goods Inventory. how does the accounting for each differ? 9) What are the advantages of costing rework? or investing in new machines. recording scrap sold for cash? 2) In accounting for scrap, which of the following statements is true? A) Normal scrap is accounted for separately from abnormal scrap. C) Initial entries to scrap accounting records are most often made in dollar terms. 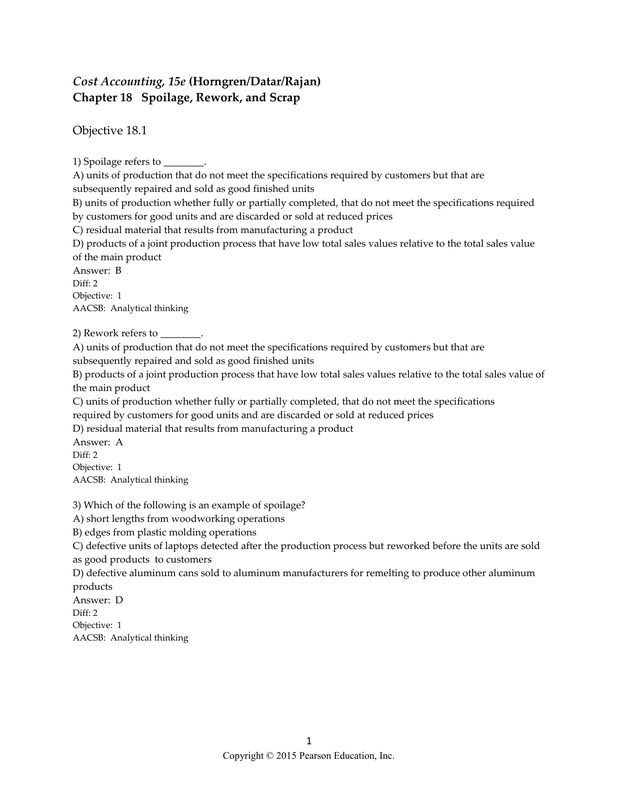 the following is the journal entry if the scrap attributable to a specific job is sold on account? inventoried and its disposal is quite lengthy, the journal entry is ________. 5) If scrap is reused as direct material rather than sold as scrap ________. 6) Which of the following statements is true of scrap? total sales values of other products, those are called scrap. 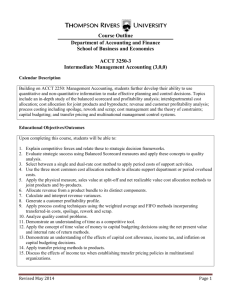 B) For accounting purpose, distinction is made between normal and abnormal scrap. D) Scrap is either sold or disposed of quickly or it is stored for later sale, disposal, or reuse. 7) Scrap is usually divided between normal and abnormal scrap. 10) Costs are assigned to scrap only if it is abnormal scrap. compared with the total sales value of the product. there are methods in which the value of scrap is recognized at the time of its sale. potential problems with the accounting procedures. Answer: First, an explanation of each item is needed. reused in another job or processing run. The potential problem with these areas is that they may be treated differently by the accounting system. policy also aids the managers who are being evaluated by their department's efforts. possible for a single firm to have all three from a single productive process? pair of Levi's Jeans sold as a "second." from a cutting process that is too small to use in any other clothing. mainly products for the building industry. spoilage, scrap, and reworked items. 4. developing high-value added products that can be produced from these various items. 3. investing in more sophisticated capital equipment that can be designed to reduce these costs. when and how scrap affects operating income). product completed. Also, since scrap has a value, it will reduce the likelihood that the scrap gets stolen. when it later gets sold. environmental laws of most municipalities. is located in a very rural area of Alabama. c. A hog renderer has hog bristles as a result of the slaughtering process. from any other source. Other uses might include selling for use as packaging materials. similar cleaning uses or dyeing the cloth and selling it for ornaments. The hog bristles can be used in shaving equipment and for bristle brushes. 1) The standard-costing method ________. 2) Under standard costing, there is no need to calculate a cost per equivalent unit. Make necessary journal entries to record all spoilage.